Sure, you know that any modern healthcare company must have a medical web resource. But today it's not enough! You'll hardly impress anybody with outmoded boring healthcare website designs. And it's important to impress: to attract attention, stick in the memory, and keep ergonomics at the same time. It's difficult, isn't it? Don't worry! We’re going to share our expertise on this matter with you. In fact, online resource’s success depends, inter alia, on two factors: useful high-demand features and compliance with the latest medical web design trends. Want to know more? Read our article! First of all, we want to tell you how the best medical website design should look like. We mean, what do users expect from the design of your website? Let's figure the issue out! No element of the site should irritate the visitor (including medical clinic website design and the presentation of information). It is necessary to give patients as much useful information on the subject of their health problems as possible. The patient needs to see detailed information about the clinic and doctors on the medical website before contacting them. Medical web resources are often visited by people no longer in good health, so they should effortlessly navigate in its pages. It's really important, and we'll discuss the issue in more detail later when talking about specific website design and development trends. When ordering the medical website development, provide also a mobile version of the resource, adapted for any device (iOS, Android, etc). Again, the issue deserves a separate discussion (wait until we begin to describe new website trends). We strongly recommend that you use medical marketing tools to promote your resource. Say, advertise your website in social networks increasing user engagement. Not only medical sites are important, but also applications of the same kind. A striking example is a Health4me mobile app. Click and read! And now let’s see what features your medical web resource should provide your users with. The most important thing is to make contact information as accessible and as clear as possible. The patient shouldn’t spend a single extra second to find the phone number of your clinic or the addresses of your medical offices. When it comes to health, the time factor is really crucial. "How to find the clinic? Where is it? And if I get lost? "- these and many other similar questions are being asked by patients, especially those who don’t know the city well. Therefore, your medical web resource must visualize the way to your hospital through an interactive location map. The healthcare resource must clearly communicate what kind of healthcare services you’re offering. Keep it in mind when looking for your medical website design inspiration. Website visitors (and, possibly, your future patients) should be able to consult a physician online beforehand. Such a feature allows your patients to make an appointment with a doctor remotely. This is another way to convince people that your clinic is worthy of their attention. Describe the history of cases of successful treatment, post pictures "before" and "after". Such a method will give your potential patients confidence and hope. Be sure to take care of a clear "call-to-action". However, remember: the healthcare site must not use too annoying and "clamorous" marketing techniques. Medical practice website design shouldn’t impose your services on patients! The only way is to advise carefully. Diversify your content with interesting information of suitable subjects: news from the medical field, useful tips, description of different treatment options for a particular disease. Of course, the quality of the published materials is very important as well as their reliability and scientific character. Are your patients satisfied with your prescribed treatment? Let them advance the opinion! Positive patient feedback can convince other people to go to your clinic with their own health problems. Well, bad reviews would come in handy too: they will help you correct your strategy on time and avoid similar situations in the future. Did you know that healthcare app development is the future of medicine? Click and read the details! Naturally, we’ve told you only about the most important features. You may come up with your own ideas when ordering the corporate website design services. The main thing is to take into account the interests of your patients (think about user-centric healthcare website design). It’s impossible to succeed without meeting the needs of the age. That's why you should follow the latest trends, it's the only way to create the best medical website design. So let's see what is popular in 2019. Responsive web design is the main condition of healthcare resource success. It’s especially true now, in a highly competitive market, when you need to provide a visitor with a maximum of positive impressions in order to attract (and keep!) his attention and improve the user experience. So your site should be adequately displayed on any devices. A responsive medical website is working this very way! It looks great on computers with different screen resolutions and has a quality mobile version. By taking care of your medical device website design, you're getting a great tool for your healthcare business at the same time. The best medical website design attracts visitors not only with visual components but also with its well-provided content. Agree, this isn’t an entertaining portal, we're talking about. Your website’s goal is to make the process of patients' interaction with your clinic as effective as possible. Therefore, your resource should be, first of all, informative. And the task of its design is to help you highlight the main aspects of your qualitative content which may include useful healthcare tips, interesting blog articles, description of doctors’ medical practices, etc. Only in this case, you can be sure you have a really great medical office website design. The user interface design should be simple and convenient. Believe us, clean medical practice website design is the basis of the resource effectiveness. The main reason for this is that today people prefer to use their mobile devices to view websites. And a mobile website should be laconic and appealing, it has no space for extra details. The next medical website design trend follows from the previous ones, # 3 and # 4 (Content-Focused Design & Laconic Design). Simplicity and emphasis on content - that's what really matters! So, you need to remove all unnecessary elements and make the remaining ones as simple and flat as possible. Thanks to this, they are better perceived in small formats and don't slow down the loading of a web resource. And, of course, your site visitors can focus on your super-quality content. If a person has visited the site of a medical company, he’s probably looking for some important information. And it means you should provide your resource with a convenient and ergonomic navigation bar. Don’t force visitors to search for the information they need for too long! One of the new website technology trends in this regard is the need to make the navigation bar moveable, it should be following the user, while he’s scrolling the page down (instead of having it permanently at the top of the page). Such a method greatly improves the user experience. The trend associated with the use of animations in web design has been “born” a few years ago, and it remains relevant now, in 2019. Most likely, the interactive design will extend a scope moving to more complex animation forms. Small animated elements are very well combined with other medical web design trends and improve the process of user interaction with the medical web pages. Along with the increasing role of animated elements, widescreen background photos and videos have also become one of the new website trends of 2019. Video gives dynamics to the web resource and allows you to immerse the user in a certain history, so he can look behind the scenes of the company's internal processes. Of course, the medical web resource should use such a trend very carefully. Moreover, it's best to ask professional UI/UX designers to help you: those who will find the golden mean and offer the right way to impress your users without risking overdoing. Bright colors could be a good choice sometimes, but now more natural palette is being increasingly used in medical website development. Neutral color shades cause site visitors to feel calm, increasing their confidence in the resource. Today, a lot of medical websites are similar to each other, like twins, and the main reason for this is completely identical images galleries consisting of template pictures, downloaded from various kinds of photostocks. Therefore, one of the new website trends of 2019 is unique, professionally shot images. Show users the real doctors of your clinic or happy patients that you managed to cure. Such an approach will help to personalize your resource by giving it a unique character. Fashion for minimalism, as well as the technological expansion of mobile devices, allowed the text to be an independent design element. Due to the need to optimize sites for mobile screens, fonts have become much larger, they often occupy the main part of the page, displacing other elements. Fonts as the key elements of graphic design look good on displays of smartphones and tablets and directly deliver a message to the user. And it leads to creating really nice medical website design when nothing deflects users' attention from the information your patients should obtain. This is one of the newest medical web design trends in web design. The fact is that site visitors are too accustomed to a clear-cut grid, so popular in recent past. The standardized grid has stopped attracting the attention of users. The "kinked" (as though “broken”) grid forms a new aesthetics, and all new is always of interest. Even reputable healthcare companies worried about the corporate style would be able to use the method in question in a more universal format (say, combining it with a classic grid). This is one more trend associated with minimalism and simplicity of healthcare website designs. Reduce the number of pop-up windows which are so annoying to users and overload your online resource. Find another way to contact the patient! 360 ° panoramas are a great way to demonstrate your medical office in a three-dimensional format, allowing a user to visit your clinic virtually. This produces a very favorable impression. WCAG, in essence, means meeting the needs of people with disabilities. It has become really relevant and even turned into one of the new website technology trends. It should be noted that, until recently, only resources of state and municipal structures had versions of sites for people with disabilities. Fortunately, now many organizations are exploring the possibility of providing all users with the chance to take advantage of web resources without any trouble. For example, in the US, the Department of Justice at the legislative level requires that the Americans with Disabilities be able to receive digital information in a format accessible to them (the Americans with Disabilities Act or ADA). And such laws exist not only in America: the trend is gaining popularity everywhere! And, of course, the WCAG approach is directly related to website design for healthcare companies. Agree, it would be strange if medical institutions didn’t take care of patients with disabilities while creating their own online resource! According to WCAG, the availability of a web platform (this also applies to medical clinic website design) is determined by the following four principles: perceptibility, controllability, clarity, and reliability. Each of them implies its own set of rules. Keep this in mind if you decide to build a healthcare website. The site is not only a marketing tool for a healthcare institute. Above all, it should help patients in their treatment. 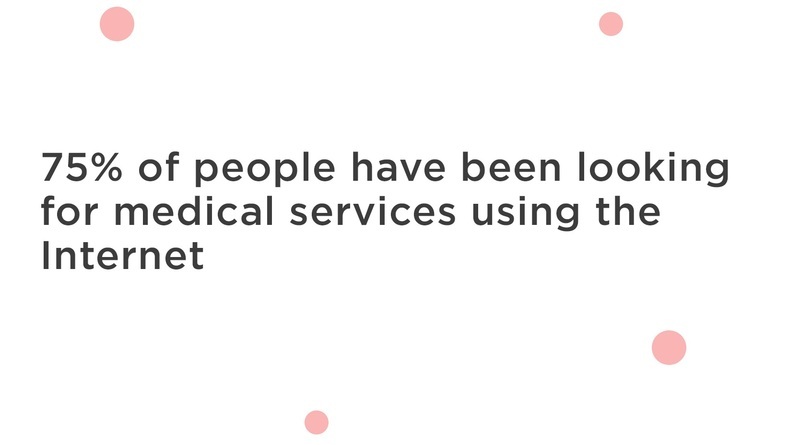 That’s why new website trends imply that a medical web resource must provide users with actionable data. We mean the information shouldn't be just a naked outline of facts, patients need a real guide able to tell them their next steps: what medicines to buy, which doctors to book an appointment with, what tests to take, etc. Discussing healthcare website design strategies, we talked a lot about both data and the visual component. Item # 16 brings these aspects together. Today, information should be easily perceived, and therefore - visualized. After all, that's the way how we, people, perceive the world (ie, visually). By the way, 15th and 16th medical web design trends are also interconnected. The clearer the data, the easier to use them to decide on the subsequent actions. That is, the visualized data is the actionable data. All of the above about the importance of best website design services can be summarized as follows: custom medical website design should be focused on the user (equivalent to the patient) and his needs. So make sure healthcare website design companies know which trends are relevant now. Don’t leave them a chance to let you down. Interested in the latest web design trends? Here is another article of the sort! We've listed the main medical web design trends of 2019. By following them, you can easily turn the site into an effective tool for your healthcare business. But, of course, everything changes with time, so stay tuned. We promise to keep you informed, just read our blog and stay in touch! And remember: medical website development is a very difficult task which requires a special approach. It's not enough to know what is popular today, you should be able to use such knowledge in practice. And if you’re not confident in your abilities to build a healthcare website of the proper level, we’re always here and ready to help you! We have a huge experience in website and app creation and are happy to offer our affordable website design services.